A day quite unlike any other, in 1945. The war is drawing to a close, time to roll up our sleeves and set about reconstruction. In a little workshop on the outskirts of Vignola, famous worldwide for its wonderful cherries, two brothers Giancarlo and Lanfranco Toschi, faced with an unusually abundant harvest, are inspired with a touch of genius. They start production on a commercial scale of what was to be able to enjoy them all year round. This is just the first in a long line of product that today are known everywhere as Frutta sotto Spirito. And thus the Toschi story begins. In 1953 Toschi teams up with the legendary, world-beating Ferrari name to launch its products. Champion driver Alberto Ascari endorses the special gift box; a miniature racing car containing three bottles of Toschi liqueurs. 1957 sees the debut of Toschi Cherry Brandy: a liqueur obtained by steeping the famous black cherries of Vignola in alcohol. By now WW2 is fast into memory and here is again room for creativity, imagination and inspiration. Work begins on the Vignola’s delicious fresh local, and our syrups and bottled Amarena cherries are born. In 1961, Giancarlo Toschi lays the foundation for the new Savignano sul Panaro (Modena) premises, still the companys headquarter. In 1962, a deluxe gift pack celebrates the products from the Vignola soil. Frutta Spiritosa and Nocino make their first appearance. 1970: the official lauch of Frutta Spiritosa (fruit bottled in alcohol), and the Toschi brand goes global. 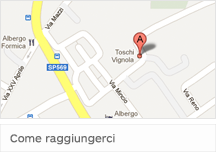 In 1981, the Vignola Research Centre launches Il Premio Ciliegia d’Oro (Golden Cherry Prize) under the sponsorship of Toschi. The prize is awarded annually to honour natives of the Modena area who have achieved notable success in the social, cultural, industrial, commercial, sports or humanitarian arenas.. In 1985 a major TV compaign launches Piper Menta, the truly original soft drink in a can from Toschi. 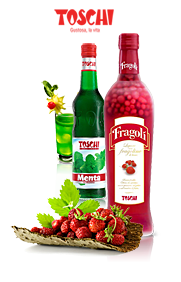 1989 is the year of Toschi Fantasciroppi, delicious syrups for a fantastically successful summer. Over the course of 1996 and 1998 Mirtillblueberry and Fragol strawberry come into being, sweet fruit liqueurs with added whole fruit. 1998 also sees the birth of a whole new business: the benchmark for quality ice-cream makers. In 2000, Toschi presents its new line in balsamic vinegar Gino Toschi Aceto Balsamico di Modena, yet another products with strong link sto the Modena tradition. In the same year the company achieves UNI-EN ISO 9002:1994 certification. In 2004, Toschi quality is endorsed with UNI EN ISO 9001:2000 certification. The following year the whole range of products receive IFS (International Food Standar) certification. Toschi makes an appearance at the 64th Venice Film Festival. The film “Non pensarci”, presented at the Giornate degli Autori (Auteurs Day), was partly filmed at the Toschi Vignola headquarters, chosen by director Gianni Zanasi as one of his locations, for its soft colours, gentle, hazy atmosphere and its authenticity. The film stars Valerio Mastrandrea, Giuseppe Battiston, Anita Caprioli and Caterina Murino. In 2006 Fragolnd Mirtillet a brand new, up-to-the-minute-minute look. An elegant, slender silhouette make the bottles look even inviting. 2008 sees the debut of another amazing new product: Toschi Sambuca Stardust. A stroke of genius and a truly dramatic effect achieved by adding flakes of edible silver to the famous anise-based Italian liqueur. By the end of 2008, the company is putting its skills and resources to work in the field of hand-crafted gourmet ice-cream. The companys new direction is clearly signaled by the new products offering businesses in that food sector a complete range to choose from, together with a specially dedicated company division and a newly organized sales network. 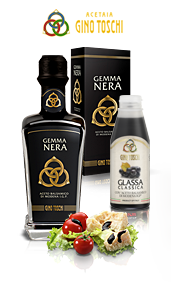 After obtaining the IGP for the balsamic vinegar of Modena, the company revises the reference line and comes the Vinegar Gino Toschi, with a restilyng the logo. The company celebrates its 65th anniversary and review in a more modern line of products with which it was born: the fruit spirit. 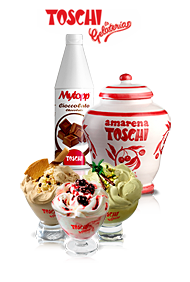 In 2012 Toschi introduces Fragolì Cream, a creamy news that combines the taste of Fragolì with the creaminess of cream. Thanks to a moderate alcohol content (17°) and to softness of flavour, this new proposal by Toschi is ideal to share with friends during an aperitif or a special moment. Inspired by the famous American donut, in 2013 Toschi creates a funny and innovative way to taste ice cream introducing Mr. Donuts. This news, appreciated by young and old people, makes pleasurable breaks thanks to colored glazes and delicious decorations, ensuring always the quality of Toschi products. In 2013 Toschi presents Balsoy, a real new product for worldwide cooking born from a balanced combination of Italian Balsamic Vinegar of Modena and Asian Soy Sauce. From the delicate meeting of these two ingredients, born a sauce that is different for balance of flavor, naturalness of recipe and gives a special and unique touch even to simple dishes. In 2014 is realized a new restyling of the line Acetaia Gino Toschi that, in addition to actualize the image of Balsamic Vinegar from Modena, provides a new classification in the labels of their balsamic vinegars to orientate the consumer in the best purchase choices. On the occasion of the 70th anniversary of the founding of company, Toschi publishes a novel called “Le Foglie del Tamarindo”. The novel, written by Marilena Toschi, is inspired by a true story happened in Vignola in the 50’s, telling aromas and flavor of Modena territory.